When photojournalist John Wallace is attacked and almost hung in his own home, the police don't believe his story. They're convinced it was a failed suicide attempt. Wallace is sectioned and placed into psychiatric care, where a further attempt on his life is made. Wallace manages to fight-off his would-be killer and escapes the psych ward but is convinced his attacker won't give up until he's dead. 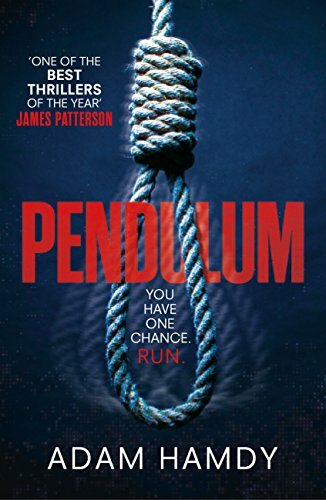 He reaches out to ex-girlfriend Connie and together they discover other similar deaths-by-hanging that have been ruled suicides and terrifyingly, they all bear a striking resemblance to his own situation. Now convinced he's in imminent danger once again, Wallace and Connie delve into the backgrounds of the other victims but are frustratingly unable to find a link. 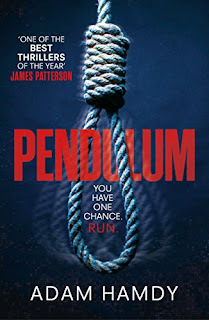 Wallace follows the trail to America but the 'Pendulum Killer' remains one step ahead. Who is he and what is his connection to Wallace? Can Wallace stay alive long enough to find the answers he so desperately needs and bring the killer to justice? What a rip-roaring ride this is! The reader is thrust straight into the action in the opening chapter and from then on it's GO, GO, GO at 100mph! John Wallace is a bit of a sorry character. He's trying to pick up the pieces of his life, move forwards and lay the past to rest. He still dearly loves ex-girlfriend Connie but knows he's messed it up for good. When events push them together once more, he grabs the opportunity for a second chance. He desperately wants a future with Connie, and she with him, but can he stay alive long enough to make it happen? I was sitting on the edge of my seat with trepidation trying to work out the connection between Wallace and the other victims. The author certainly has a flair for keeping the reader guessing. Yes, it's all a bit unlikely - but this isn't real life, this is entertainment baby! It's thrills and spills at its very best. I experienced every emotion and loved every second of it. If you like no holds barred full-on action from beginning to end; I recommend you read this book - like NOW! I received an Advance Reader Copy. My thanks to Adam Hamdy, NetGalley and Headline. You wake. Confused. Disorientated. A noose is round your neck. You are bound, standing on a chair. All you can focus on is the man in the mask tightening the rope. You are about to die.